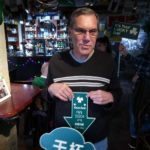 By Jim Boyce | The year’s first snow is helicoptering down in Beijing and adding a white fringe to the traditional green of Saint Patrick’s Day. 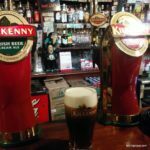 Here are a trio of Irish pubs at which to celebrate. 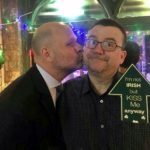 Lido local The Irish Volunteer has a “Get Lucky” theme that included a visit from Beijing bar legend Karl Long earlier this week. 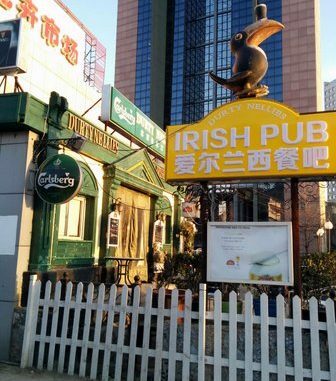 Get corned beef sandwiches (rmb50) and all-you-can-drink Tsingtao from 3 PM to 8 PM (rmb100). You’ll find plenty of Guinness, Jamesons and Baileys, too, as well as favorites like Irish stew. 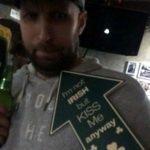 And, as the photos below show, you don’t have to be Irish to join the fun. Word is the IV team will get out the corn toss boards today for some casual games. Saturday happy hour runs from 2 PM to 6 PM, with 30 percent off most drinks and buy one, get one free mixers, Tiger beer and local draft. Along with plenty of Saint Patrick’s Day shenanigans, you can also catch the six-nations match between Ireland and England at 10:45 PM. 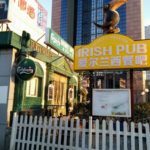 And for the hungry, Paddy’s menu lists Irish beef stew (rmb88), beef and Guinness pie (rmb88), and the Irish “poutine” with Guinness gravy. Photo below is of the huge crowd for the Mayweather-McGregor fight last year. 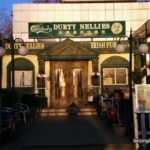 Last but not least is veteran Durty Nellie’s, a sprawling Liangmaqiao venue that is a bit off the radar but nonetheless a worthy place to sip some Guinness and Kilkenny, knock back a shot or two of Jameson and fuel up on pub grub.